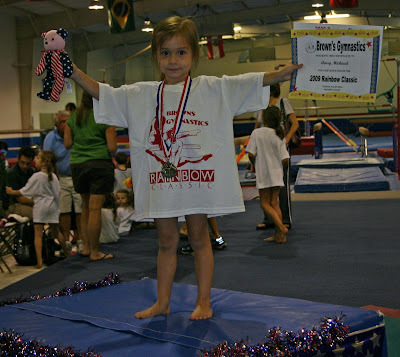 My Daughter's First Gymnastics Exhibition! It ended up being a pretty busy day, so I only got one SOA project done. The challenge was to use one of Lauren Meador's Timeless Templates and it had to have a clear element on it. 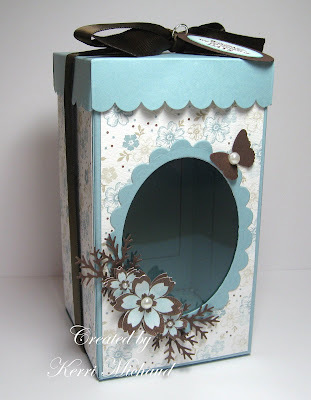 This For Keepsake Box Template is perfect for the challenge. I used SU Baja Breeze cs as the base, and SU Parisian Breeze DSP. I also used some Verve gorgeousness in honor of this day! These flowers are from the Because of You set, and the sentiment is from the Wonderful Wishes set. Have a fabulous weekend, and thank you so much for stopping by! oh my gosh I love this! beautiful! Super cute photo of your daughter! Congratulations on her achievement! She is do too cute! Your box is pretty too! Your daughter is a little Star!!! And your gift box is so pretty! How exciting - look at her with her lil' certificate and Beanie Baby - - how fun for her for sure! You're going to have a little Olympic athlete on the cover of Wheaties in no time! Your daughter is just darling. She looks like she is in heaven! I love the box you made with this template. Those verve flowers call to me everytime I see them now! oh wow your daughter is just too cute and precious!! she looks so proud and accomplished in that picture :) LOVE it !! Aww, she is adorable!! She looks so happy! That's my girl! I'm really proud of her. Wish I could have been there. Maybe next time! Good job, Honey (granddaughter)! Good Job Aves! Yeah the box is cute but Avery is way cuter!!!! !